Evaluation of long-term tumor control, normalization of hormonal hypersecretion, including incidence and time course of pituitary dysfunction following postoperative radiotherapy of pituitary macroadenomas. In a retrospective study, the data of 87 patients with pituitary macroadenomas (61 non-secreting adenomas, 26 secreting adenomas) treated between 1984 and 1994 were analyzed. All patients underwent surgery and received postoperative external-beam radiotherapy with a mean dose of 50.4 Gy (range 46–54 Gy). After a follow-up of 15 years the local tumor control rate achieved was 93.0% for non-secreting adenomas and 100% for secreting adenomas, respectively. Normalization of endocrine hypersecretion was noted in 24 of 26 patients (92%). Detailed endocrinological follow-up data were analyzed by an experienced endocrinologist in 77 patients. After a median follow-up of 10.54 years (mean 10.22; range 1.39–20.75 years), in 75 of 77 patients (97%) a hypopituitarism was observed (partial hypopituitarism, n = 28 [36%], panhypopituitarism, n = 47 [61%]), and 68 out of 77 patients (88%) showed evidence of radiotherapy-induced pituitary disorders. The somatotropic function was most commonly affected, followed by gonadal, thyroid and adrenal function. The gonadal axis showed to be the first to be disturbed. 67 patients (87%) required a hormone replacement therapy. Radiotherapy after pituitary surgery is highly effective in reducing hormonal hypersecretion and preventing recurrences of pituitary adenomas. However, pituitary insufficiencies are commonly observed after radiotherapy requiring a close follow-up to ensure timely diagnosis of pituitary dysfunction and an early inception of hormone replacement therapy. Ziel der retrospektiven Analyse war die Evaluation der lokalen Tumorkontrolle sowie der hormonellen Normalisierung nach konventioneller postoperativer Strahlentherapie in der Langzeitbeobachtung. Zusätzlich wurden die Inzidenz und der zeitliche Verlauf von Hypophyseninsuffizienzen untersucht. 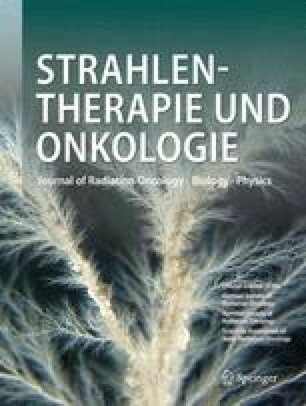 Zwischen April 1984 and November 1994 wurden 87 Patienten mit Makroadenomen der Hypophyse (nicht-sezernierende Adenome: n = 61, sezernierende Adenome: n = 26) einer postoperativen Strahlentherapie unterzogen. Die Bestrahlung erfolgte mit einer medianen Dosis von 50,4 Gy (Spannweite 46–54 Gy). Nach 15 Jahren betrug die lokale Kontrolle bei nicht-sezernierenden Adenomen 93% und bei sezernierenden Adenomen 100%. Eine Normalisierung der hormonellen Hypersekretion konnte bei 24 von 26 Patienten (92%) erreicht werden. Detaillierte Informationen über die hypophysäre Funktion lagen bei 77 Patienten vor. Nach median 10,54 Jahren wurde bei 75 von 77 Patienten (97%) eine Funktionsstörung des Hypophysenvorderlappens diagnostiziert (partieller Hypopituitarismus: n = 28 [36%], Panhypopituitarismus: n = 47 [61%]). Bei 68 von 77 Patienten (88%) zeigte sich eine radiotherapiebedingte Störung hormoneller Funktionen. Die somatotrope Achse war am häufigsten betroffen, gefolgt von der gonadotropen, der thyreotropen und der adrenokortikotropen Achse. In der Analyse des zeitlichen Verlaufs zeigte die gonadotrope Achse als Erste eine funktionelle Störung. 67 Patienten (87%) entwickelten eine substitutionspflichtige Hypophysenvorderlappeninsuffizienz. Mit der konventionellen postoperativen Strahlentherapie konnte eine ausgezeichnete lokale Kontrolle in der Langzeitbeobachtung erreicht werden. Die Rate an Hypophyseninsuffizienzen erfordert jedoch in einem hohen Prozentsatz eine Hormonersatztherapie und macht lebenslange endokrinologische Kontrollen notwendig.